Instead of having a long list of payment types and being able to select only a single payment type for a payment, you can quickly attach multiple tags to a payment, in addition selecting a payment type, to identify that payment. Dentrix Ascend has several default tags to choose from, and you can define your own. Payment tags are very flexible, and they are a powerful tool for reporting. You can use payment tags to filter the Payment Analysis Report and the Day Sheet. When you are posting or editing a patient payment or an insurance payment, or when you are posting a patient payment while checking out a patient, select the Tags tab if it is not already selected. In the search box, begin typing the name of a tag. Once you have entered at least two characters, the results list appears with any matches (not case-sensitive). Continue typing as needed to narrow the results list. 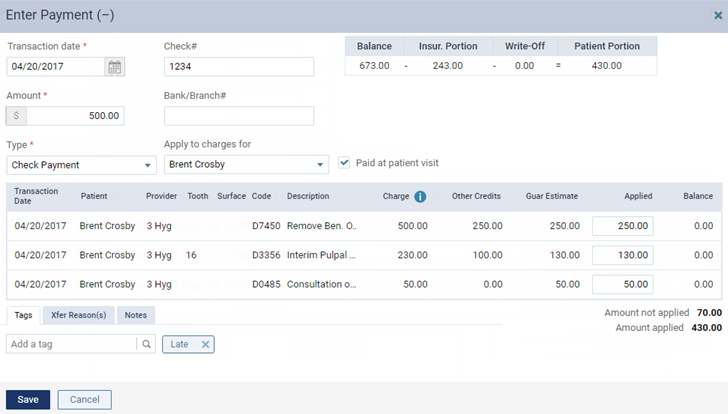 Note: Dentrix Ascend provides the following tags by default: American Express, CareCredit, Citi Health, Copayment, Discover, Late, MasterCard, Paid at visit, Prepayment, and VISA. If the correct tag is listed, click (or tap) it to attach it to the payment. If the correct tag does not exist, finish typing the name of the tag (spaces are allowed). Make sure that the name is capitalized as desired. Then, click (or tap) Create to create the tag and attach it to the payment. Note: The tag that you have created is now available to all Dentrix Ascend users in your organization. Tip: To remove a tag from the payment, click (or tap) that tag's X.